We’ve seen the encounter of wild animals and drones, and what it looks like when a real bird takes down an electronic one. A recent video from CCTV+ shows another example of wild animals versus a drone. 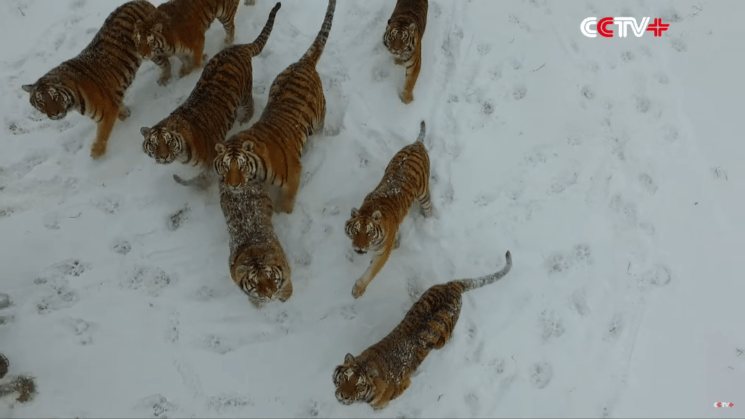 In this video, a pack of Siberian tigers chases the drone around while it’s recording them. Eventually, it takes just one swing of a paw to take it down, after quite an unusual game of cat and mouse. Or cat and bird, if that makes slightly more sense. There are definitely a lot of possible applications of drones, and they seem to increase as technology progresses. And Harbin Siberian Tiger Park in China uses the drones for quite an unusual purpose – exercise. As you can see in the video, these Siberian tigers are not only intimidating and huge, but they are also chubby. They live in captivity and they are well fed, so it’s no wonder they’re not in their best shape. The habitat staff uses the drones to make the big cats run around and chase it to get the necessary exercise. As the drone flies above them, the tigers get alert and try to catch it. I suppose it wasn’t a part of the plan, but at one point they actually succeed in catching it. One of the tigers swipes at the drone with a paw, and it crushes down onto the ground. What is quite fascinating is that the pack immediately gathers around. They start ripping the drone apart and chew on it as it was a real prey. The drone doesn’t seem to be able to handle all the munching and it starts giving off smoke, which scares of the tigers so they step back. According to CCTV+, the staff members of the habitat used a protected vehicle and picked up the remains of the drone afterward. The tigers are chubby, but this exercise and the spring that’s soon to come should get them back in shape. 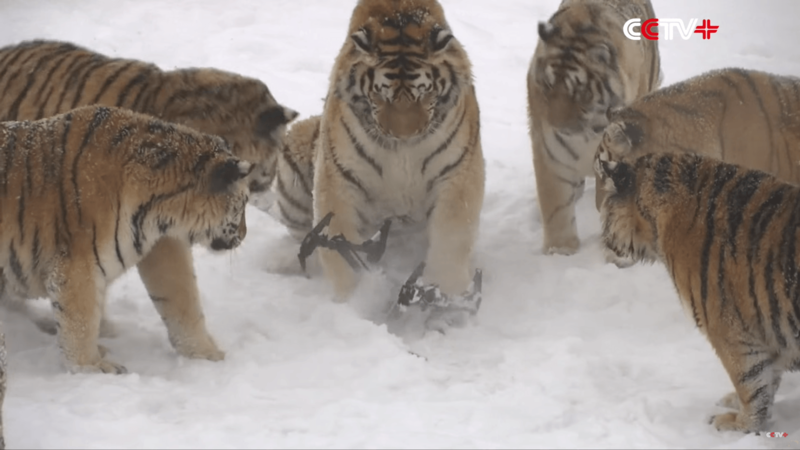 And although this video is very fun to watch, I have a duty to bring up that Harbin Siberian Tiger Park is said to be a tiger farm rather than a sanctuary. The comments and reports I’ve read are very different and mixed, so I can’t decide which are true. And although I’m an animal lover, I believe it’s a topic for another blog. For now, let us enjoy the footage of glorious cats doing what they do best – hunt. Even if it’s just a drone. I feel like there are better ways to do this than exposing tigers to spinning blades. Sad actually….and that is in regards to how and why these tigers are kept. They are not wild…..too fat to be wild in winter. Always question the source. This is a bad one.